Product prices and availability are accurate as of 2019-04-19 22:30:18 UTC and are subject to change. Any price and availability information displayed on http://www.amazon.com/ at the time of purchase will apply to the purchase of this product. In this impressive anthology John Tranter weaves many threads into a portrait of Australian poetry in 2012. Emerging poets sit alongside the celebrated, travelling from Lake Havasu City to Graz, and nursing homes to fairgrounds, with characters as diverse as David Bowie, Emily Dickinson and Rumpelstiltskin. The Best Australian Poems 2012 will satisfy a hunger for storytelling and a yearning for beauty. 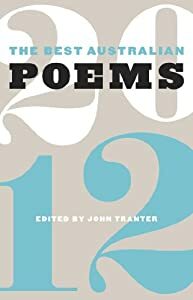 John Tranter is the author of more than twenty books. His 2006 poetry collection Urban Myths: 210 Poems: New and Selected won multiple awards, including the Victorian, NSW and South Australian Premiers’ Prizes. His latest book is Starlight: 150 Poems.